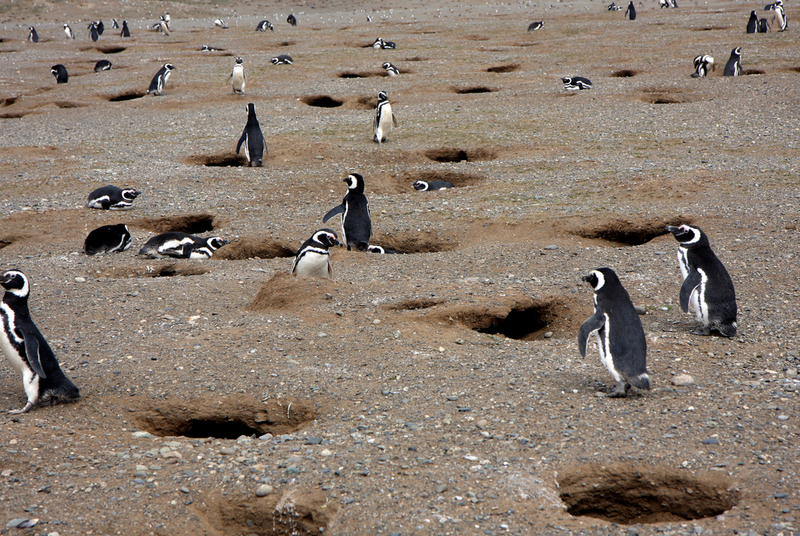 This penguin colony is located 65 km north of Punta Arenas, in the Otway Sound. The 6,000 Magellanic penguins which live there make it both a tourist attraction and a scientific site. The nesting season is from October to April. In 1584, Captain Sarmiento de Gamboa founded the city of Rey Don Felipe here, on the shores of Bahia Buena, 60 km south of Punta Arenas. The inhabitants died of starvation, and for that reason the English corsair, Thomas Cavendish, on seeing the remains of the colony years later, named it Port Famine – Puerto del Hambre in Spanish. The island forms part of the Los Pingüinos Natural Monument, located 25 sea miles north of Punta Arenas. It is next to Islote Marta. At one end there is a lighthouse, and the population of Magellanic penguins living there is estimated at 50,000 pairs. This little town, dedicated to cattle-raising, stands on the shores of the Skyring Sound 87 km north west of Punta Arenas, and is surrounded by breath-taking natural beauties which include the Fitz Roy Channel. There is a ferry from here across to Isla Riesco. This little town lies 100 km north of Punta Arenas, in the municipality of Laguna Blanca. It provides basic services to satisfy the needs of the 400 inhabitants, most of whom work in cattle-raising. It starts in the city of Punta Arenas and continues to the Península Brunswick. Then passes by Bahía de Agua Fresca, Punta Santa Ana, Puerto del Hambre, Fuerte Bulnes and Faro San Isidro. Se inicia en la ciudad de Punta Arenas hasta la península Brunswick. Pasa por la Bahía de Agua Fresca, Punta Santa Ana, Puerto del Hambre, Fuerte Bulnes y Faro San Isidro. This town, founded in 1904 by the Sociedad Explotadora de Tierra del Fuego, was named after the administrator of the company. This valley, 100 km from Cameron, is named for the beavers which were brought from Canada to Ushuaia and have spread throughout the area. You can see their dams in the river and there are magnificent forests with varied species of fauna and flora. This is one of the most beautiful lakes in the region with its many beaches, inhabited by hundreds of birds, and offering views across to the mountains of Tierra del Fuego. There is plenty of firewood if you want to camp, and the lake is full of both brown and rainbow trout, making it very popular with fishermen. This oil camp and plant was opened in 1962 and serves for the extraction of propane, butane and natural gas. It is at the northern end of the island of the same name. This little town was constructed in 1958 as a residential and operational center for ENAP in Tierra del Fuego. There are more than 150 houses and comfortable facilities.